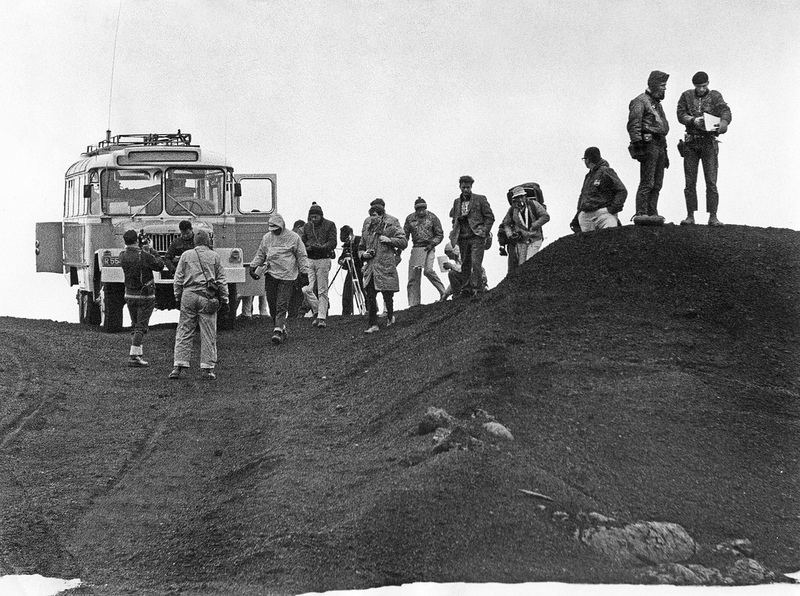 Thirty miles from the Arctic Circle, in Husavik, a town with 2200 souls, a small but ambitious museum invites visitors to experience stories of exploration – including the most complete explanation of Iceland’s own “lunar mission” as a training location for the Apollo astronauts. “The Exploration Museum tells stories of all types of exploration – from the Vikings to caves outer space. The common themes – human curiosity and the desire to uncover something new,” said Örlygur Hnefill Örlygsson (Orly), the museum’s founder and leader. 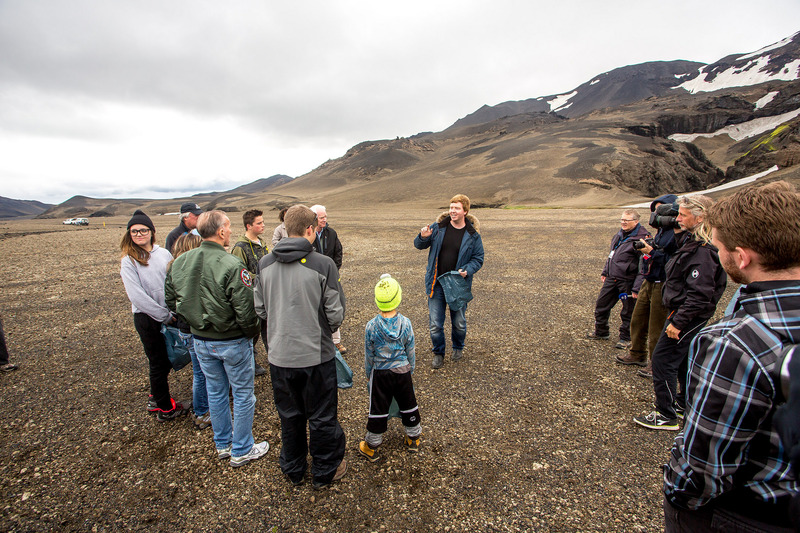 Orly explaining the geology of the Askja region to the family of Neil Armstrong during a visit in 2015. “I managed to get some good stories and some amazing photos, which form the heart of the exhibit,” Orly added. 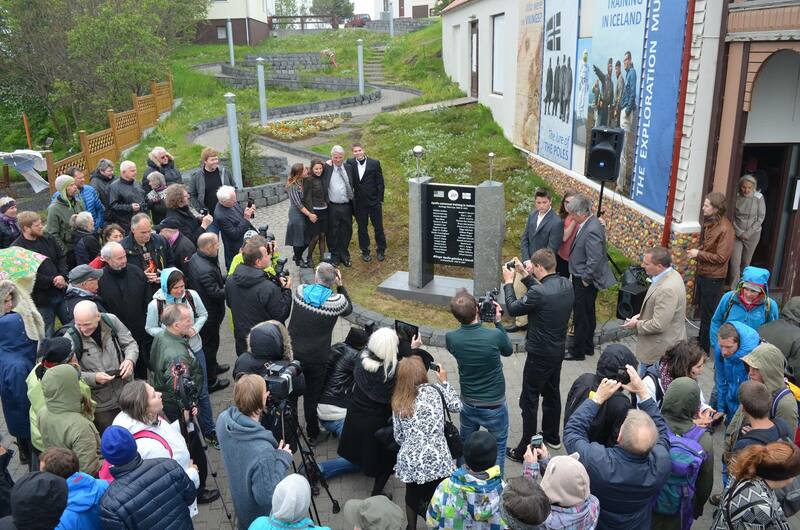 The family of Neil Armstrong unveiling a monument in Húsavík, Iceland honoring Iceland’s part in the Apollo program. The astronauts themselves: “It was very powerful to get to know the astronauts. The stories about them were still vivid fifty years later. The astronauts were expected to be role models, and they had to be very discreet about their partying activities. And they partied a bit in Iceland too. In order to purchase liquor, they created a coded language with a local journalist to radio in orders. ‘Blue shirts’ was code for Vodka, ‘white shirts’ was code for whiskey. They also went fishing and did the touristy things one did here in those days. Connecting with local history: the mission was not secret, and the Astronauts even had a press conference when they arrived. One of the first things they mentioned is that the Icelandic Loftleidir airliner they had flown from the US was named for Leif Eriksson, the Viking explorer said to have been the first European to land on North American soil. 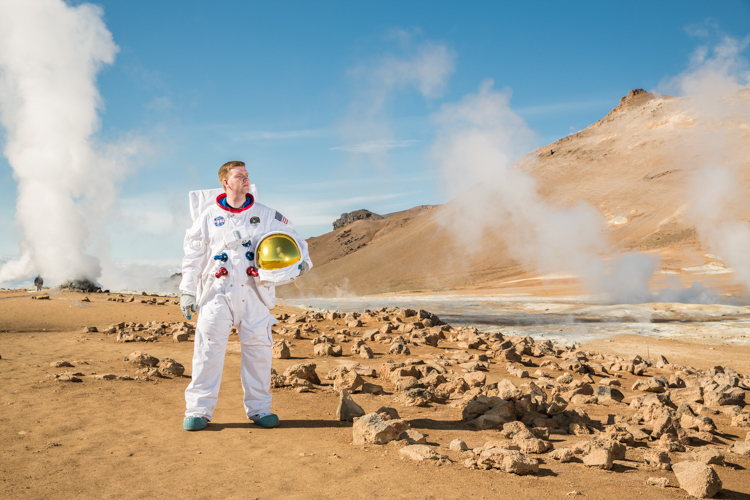 The Exploration Museum’s exhibit is built around these stories and photos, but also includes personal items from the astronauts, an Icelandic coin from the astronauts’ first trip, rock samples used during the geology part of the training and even a small moon rock. The mission of the museum also focuses on stimulating the spirit of exploration more broadly. Every year, the museum hosts the Explorers’ Festival, where up to eight explorers from around the world come to exchange their stories, be they astronauts, cave specialists, or even scuba divers. Aside from sharing their stories, they share their art, sketches, poetry and music, and the Leif Eriksson Awards are given for life exploration achievements and for young explorers. Here is a video focusing on how Iceland and the area near Husavik can be used for training purposes for future astronauts. For those who make the six-hour trip from Reykjavik to Husavik (or the faster but pricey AIr Iceland Connect flight), there is much to explore in the nearby area, including glaciers, fjords, bays and opportunities to get out onto the sea. In the summer, it is also possible to drive across Iceland to Husavik through the stunning and largely untouched Icelandic Highlands. 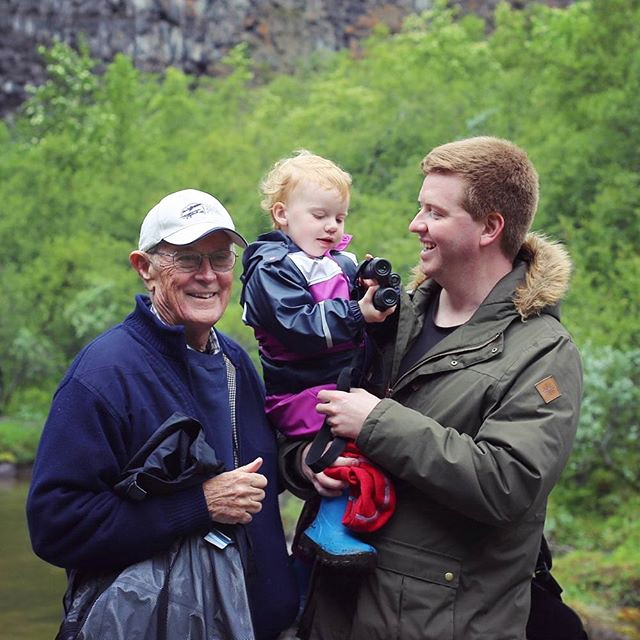 Moon walker Charlie Duke visiting Ásbyrgi last year with Orly and his daughter Aníta. 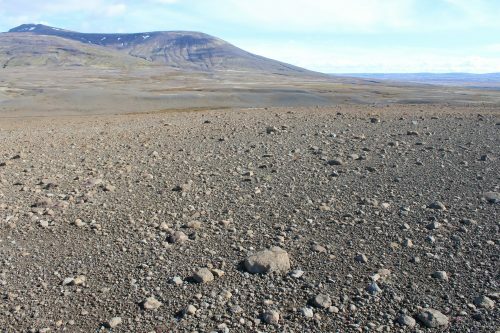 This trip combines the wonders of Iceland with an adventure of a lifetime in the highlands and with a tailor made exploration trip in the Husavik area, Limited spaces and deadline for registration is May 1st 2019. Photos by Helga Stina – Frida Hjaltested and courtesy of The Exploration Museum in Husavik.